As our industry changes, your home care software needs to stay updated to meet these challenges. We pulled out a few of our most popular feature enhancements from the last quarter just in case you missed them. Not yet a customer? Request a demo to see the full ClearCare platform. 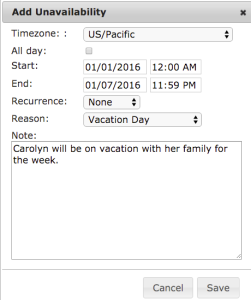 Users can now designate a reason and provide customized notes when adding caregiver unavailability. A brand new Custom Report allows you to track each type of unavailability closely by caregiver, by date, and more. We added a new filter to billing and payroll pages to allow users to show and hide non-payable or non-billable items. Using these filters streamlines the billing and payroll process even more, saving precious time. You can now designate which administrators receive new application alerts when using the integrated caregiver application. This enhancement allows you to route notifications to the administrator(s) who manage hiring and recruitment. Integrated telephony just got even better! As part of the rollout of our latest innovation, WorkSafe Central, caregivers will now be required to report on shift safety with a simple yes or no question during clock out. 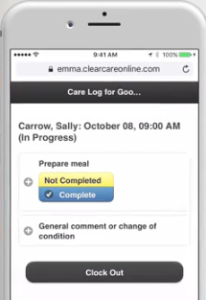 Caregivers can now report on shift tasks in any order, based on their activity with the client throughout the day. They will still be required to report on every task at the end of the shift. By popular demand, we have adjusted the telephony system to prevent caregivers from clocking out during the clock in call. This one small measure will help to prevent user error and save everyone some time! Like these updates? Look out for more blog posts like this one in the future to access industry updates, educational content to grow your agency, and product updates.